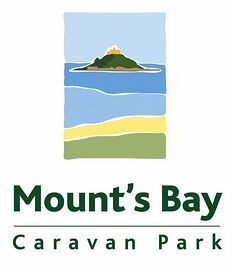 Mount's Bay Caravan Park is a small, exclusive, family-run park of 17 caravans, catering for families and couples only, and is just 50 yds from a sandy beach. 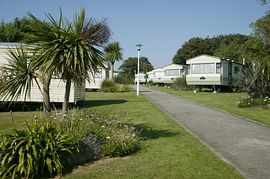 The Caravan Park is ideal for children with no cars on site other than for loading/unloading. No dogs are allowed. Our private car park is adjacent. Situated on the shores of Mount's Bay facing the beautiful and historic St Michael's Mount, Marazion offers many attractions to holidaymakers and is an ideal centre for seeing Cornwall. Facing south and sheltered from the north winds, the semi-circular sweep of the Bay enables visitors to enjoy vistas of the most beautiful part of west Cornwall. The Park includes a delightful heated outdoor swimming pool exclusively for guests' use throughout the summer. Depending on weather conditions, this may not be available before Spring Bank Holiday (end-May) or after mid-September. On-site facilities include a laundry, payphone and information kiosk. Marazion village is approx 400 yds away with plenty to see and do. Here in one of Cornwall's oldest Charter Towns, there are several pubs, restaurants, shops and art galleries. At low tide, you can walk over the beach and along the causeway to the off-shore island of St. Michael's Mount or go by ferryboat. 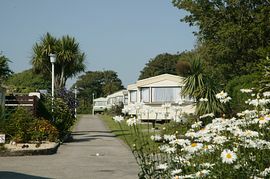 Penzance is less than 3 miles away (a pleasant walk along the sands) offering many attractions to visitors; its tropical gardens are a delight. Visitors can make day trips to the Isles of Scilly from Penzance either by helicopter or boat. The view of the cliffs on the Land's End peninsula from the deck of the Scillonian is a sight to be remembered. St Ives, with its many beaches and the famous Tate Gallery, is just 8 miles away. 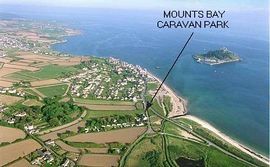 By Road: Leave the A30 at roundabout before Penzance, following the signs to St. Michael's Mount. 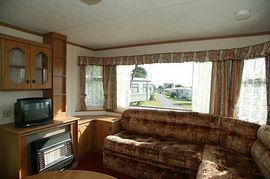 Bookings are from Saturday to Saturday, although short breaks are sometimes available outside July, August and September. Details available on request. Closed from January 15th to March 15th.